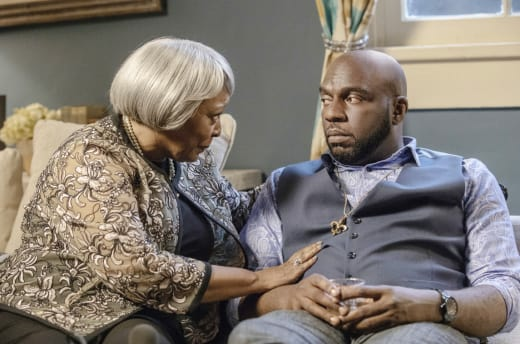 Prosper Denton was handing out all of the good advice and hard-earned wisdom on Queen Sugar Season 3 Episode 7. Let's just hope somebody was listening. That the Landry's were kicking the tenants off of their leased land for some deceitful purpose certainly didn't come as a shock, but I figured that they were expanding their operation or maybe planning to sell out to some housing development. I never expected that they were throwing black farmers off of their farms to build a private prison. Nova, Violet, and Remy were all upset by Charley's plan to work with and infiltrate the Landry's organization, but if she hadn't they wouldn't know anything about this disturbing arrangement until it was too late to stop it. The question is, can it be stopped even now? 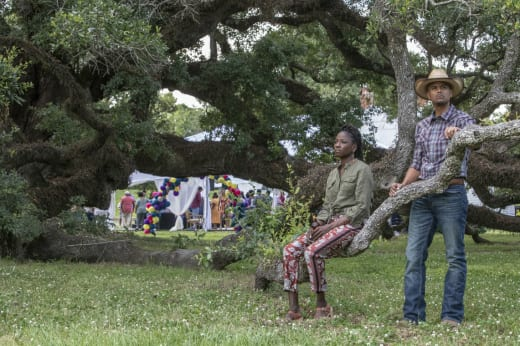 If the Landrys are working with the government, I have to believe it's possible that if the Bordelon's land is the only thing standing in their way to completing this project, they can take it through eminent domain. There isn't "just compensation" for land that former slaves fought and died to own to keep within their family. Losing their property so that the Landry family can profit off of a private prison that will no doubt house mostly black citizens would be the ultimate travesty to any sense of justice. As upset as the Bordelons are right now, I have to believe that Charley will come up with a plan to stop Landry's plan. Not that Charley won't need the rest of the family's help, but she is the person who can see several steps ahead. Charley is the only one calculating enough to take on the Landrys at their own game and win. Or at least I hope that's the case. As if that devastating revelation wasn't enough, each of the Bordelons was battling their own personal crisis. Nova was rocked by the news that her daddy had once considered suicide after his wife died leaving him with the farm and children to raise on his own. None of us are so strong that we can't find ourselves in dark places. Permalink: None of us are so strong that we can't find ourselves in dark places. Grief, fear, and depression can overwhelm anyone no matter how strong, and Prosper was absolutely right in pointing out that it took great strength for Ernest to call a friend and talk it out. 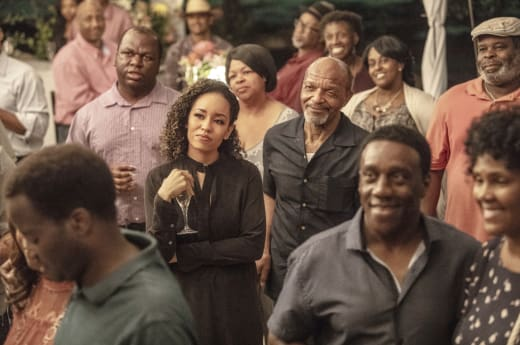 None of that should diminish Ernest in Nova's eyes, but it only added to the poignancy of what this family has had to overcome to keep their land. Nova leaned on Remy, although there was little talking involved and these two need to talk. I fear that Nova will push him away again once she's feeling stronger. Remy deserves better than that. Charley was still reeling from learning that Davis had an affair that produced a child while they were married, and now she had to deal with the entire world knowing about it. Once again, Prosper's advice was spot on. Your love story doesn't have to be over, Charley, that's up to you. You can stay distracted by your past or focus on your future. Charley handled Jacob Boudreaux's advances admirably, but I don't know how long she can hold him off before he gives up, becomes angry and turns on her. It's an emotional highwire act being able to string him along without giving him what he wants from her. 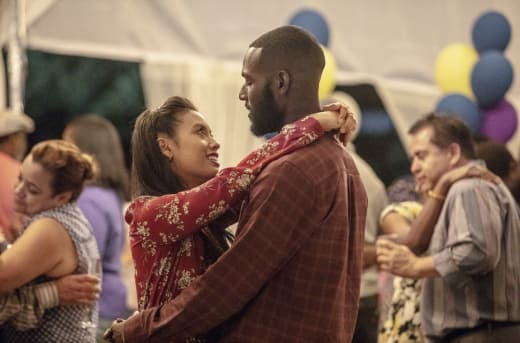 Charley's date with Romero was sweet, but I wonder if this is the right time for Charley to be diving into a relationship with someone. She's got an awful lot on her plate right now, and I'm not sure that Romero will be anything more than a pleasant distraction, which isn't fair to him. Ralph Angel and Darla hit a crossroads over Blue and moving on from one another. It was cute how Ralph Angel lost all of his game when Trihn walked into Violet's birthday party. And although he has every right to move on, spying Ralph Angel, Trinh and Blue together was a lousy way for Darla to find out he was dating someone. Ralph Angel could have made more of an effort to let Darla have Blue for the day and yet have Blue come over for at least part of Violet's party. I don't know that he "forgot" to tell Darla about Vi's birthday on purpose, but subconsciously he may still be trying to punish Darla. If both parents can remain civil and put Blue's needs above their own, a formal custody agreement could be a good thing for everyone. Finally, we get to Violet's 60th birthday bash. Nothing illuminated Violet's feelings about Hollywood's mother better than when she said, "Bless your heart" when the woman entered her home. But Willa Mae was trying. Her gift of a custom-made Vi's Prized Pies apron was thoughtful, and I couldn't fault her for worrying that Hollywood was giving up his dream to have children to be with Violet. Mother's worry about their kids. Hollywood is a grown man, and he knows what he wants, and he wants to marry Violet. She's my soul mate. I can't help the package it comes in or what date is stamped on it. It just is what it is. The argument over Violet taking Hollywood's last name brought some long-simmering issues to the surface. Despite the anger and the hurt, it was good that these two finally talked it out. Willa Mae was right in that it was a little presumptuous of Hollywood to expect a 60-year-old woman to take his last name, but it meant a lot to him. Violet has fought so hard for her independence that she doesn't want to give up an inch of it. As Willa pointed out, those scars will probably always be there, and Hollywood's going to have to come to terms with that. But Violet made concessions too when she agreed to plan the big, blowout, wedding that Hollywood has been hoping for. 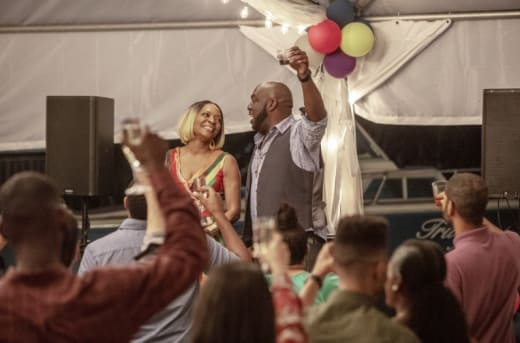 Now if they can only defeat the Landry's plan, that wedding will be a celebration no one will want to miss! 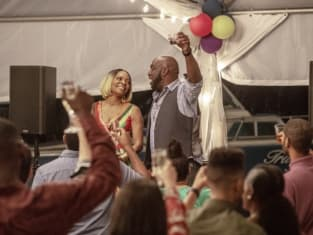 Check back for my review of Queen Sugar Season 3 Episode 8, and until then, you can watch Queen Sugar online here at TV Fanatic. Kids says things they don't always mean; adults do too. Permalink: Kids says things they don't always mean; adults do too. Baby, the box is empty because you're a woman who knows what she wants and whatever you want for your birthday I'm going to fill that box up with it because nothing is too good for Ms. Violet Bordelon.